1. What prompted your team to create Badminton Monthly? Created by a group of passionate enthusiasts, the lack of coverage that authenticates the sport of badminton is part of what spurned us – we would be the only badminton dedicated magazine in North America, but perhaps the only English monthly magazine in the world. 2. Who is in your team and what roles do the different members of your team have? What unique skillset does each member of the team bring to BM? 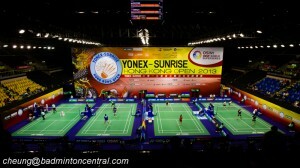 for more information, you can meet our team athttp://badmintonmonthly.com under the “about us” tab. 3. With online media being cheaper and faster to deliver, what is the reason behind a printed media? paper cannot be overlooked with its ability to be saved for future generations to discover or for marketing the sport of badminton at a busy airport. 4. What is your revenue stream and model? Most of our revenue comes from magazine and advertising sales. If you are interested in advertising with us, please contact us atads@badmintonmonthly.com. 5. How do you plan to fund to kickstart your operation and what is your funding goal? 6. What type of articles do you plan to have in Badminton Monthly? 1) Players profile – from your local every day player to Olympic hopefuls. (especially if US players are present). 3) Skill / Technical feature – learn a lesson from one of our US coaches! 4) Stretches / Fitness article – injury prevention and performance enhancement specifically for badminton. 5) Original badminton comic – entertaining and educational. find out what happens in Sampson High School badminton team. submissions / photo contests / “my badminton 2 cents” and much much more! 7. What is the scope of your coverage? Will it be USA only or international? Depending on what is going on internationally, we will cover both North American and International stories. With the type of stories in Badminton Monthly, our target audience includes badminton enthusiasts of all ages and skill levels. We will even have a spotlight on kids for our younger badminton players to enjoy! 9. What is the cost of each copy? The cost of each copy runs roughly $6-8 dollars an issue depending on how much outside help we use and how many issues we print and sell. If you factor in wholesale and subscription pricing, the cost, as with many things in life, are too high. 10. Will there be a subscription option? Yes. $59.98 for a one-year and $107.78 for a two-year print subscription. 11. Where can we find BM? Will we see them in newsstands around the country? You can find BM at your badminton specific facilities and few selected sport equipment stores. We do plan to distribute through newsstands and other channels in the future.